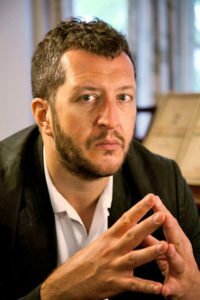 The English musician Thomas Adès, esteemed composer, pianist, and conductor who this season becomes the BSO’s first Artistic Partner, looks to be settling into a large role as contributor to the local classical scene. On October 28th he performs Schubert’s Winterreise at Jordan Hall with the acclaimed tenor Ian Bostridge, in a joint presentation of the BSO and the Celebrity Series. 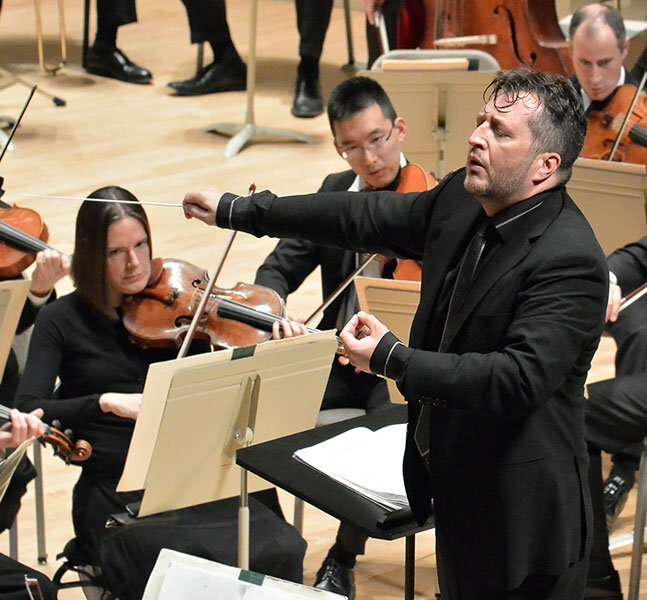 Two days later, October 30th, Adès joins the BSO Chamber Players and mezzo Kelley O’Connor as pianist and conductor to open the ensembles with his own own Court Studies from the Tempest, the Trout Quintet, Britten’s Sinfonietta for Winds and Strings, plus chamber arrangements of Shakespeare-oriented songs by Brahms, Stravinsky, and Purcell. Wednesday November 2 at the Goethe-Institut, he will participate in a free “conversations with creators”; student composers from Boston-area music schools will also attend Adès’s BSO rehearsal the next day and participate in a conductor / composer Q&A afterward. That day and the next two, the new Artistic Partner leads the orchestra and soloists Christianne Stotijn and Mark Stone in his own acclaimed Totentanz for mezzo, baritone, and orchestra, Britten’s Sinfonia da Requiem, and Sibelius’s Tapiola. Premiered in 2013 at the BBC Proms, Totentanz sets a 15th-century text telling of a charismatic and gleefully macabre Grim Reaper and the procession of his many victims, whom the audience meets in descending order of social standing. Britten’s Sinfonia da Requiem is dramatically expressive, while Sibelius’s atmospheric final orchestral poem, Tapiola, is one of the composer’s many works based on Finnish legend; the BSO hasn’t performed it for 40 years. Adès’s rich commitment to the BSO as Deborah and Philip Edmundson Artistic Partner will span over the next three years a range of activities reflecting his gifts as one of the great musical minds of the 21st century. Tapiola was written in 1926, its subject the frigid, forbidding Finnish pine forests and Tapio, their ﬁerce god-spirit, who rules over the trees and wildlife. After a blustery opening, all sense of time is suspended, and for nearly 20 minutes the music creates a remarkable picture of the stark landscape via the composer’s archetypical orchestration: breezy sighs and freezing gusts from the strings and high winds rustling leaves on branches and on the forest ﬂoor, brasses and timpani creating a shifting sense of three-dimensional space. Adès joins frequent collaborator the English tenor Ian Bostridge for a performance of Schubert’s song cycle for voice and piano set to 24 poems by the poet Wilhelm Müller depicting the journey of a lonesome, griefstricken traveler who leaves love behind and contemplates his mortality on a frozen winter road. Six excerpts from the composer’s 2004 opera the Tempest make up Court Studies, for violin, cello, clarinet, and piano. Three other Shakespeare-inspired works are included: Brahms’s Ophelia-Lieder, arranged by John Woolrich for voice and chamber ensemble; Stravinsky’s Three Shakespeare Songs; and Two Songs from Purcell’s Tempest arranged by Adès for voice and piano. All three feature mezzo Kelley O’Connor. To open the BSCP program, the musicians perform music by another groundbreaking English composer, Britten’s three-movement Sinfonietta, written in 1932. Occupying the second half of the program is Schubert’s surpassingly tuneful Trout Quintet for piano and strings, which the composer completed when he was just 22. The Boston Symphony Chamber Players feature first-desk string, woodwind, and brass players from the BSO, and the October 30th concert features Malcolm Lowe, violin; Haldan Martinson, violin; Steven Ansell, viola; Mihail Jojatu, cello; Edwin Barker, bass; Elizabeth Rowe, flute; John Ferrillo, oboe; William R. Hudgins, clarinet; Michael Wayne, clarinet; Richard Svoboda, bassoon; and James Sommerville, horn.